The authors skillfully present different approaches to the same problem and even different ways to look at the same type of data. If you have ever been stumped by a controversy in product assessment, the design of studies, or the analysis of data, you will find the answer in this book. 1. The Role of Sensory Science in the Coming Decade. 4. Contrasting R&D, Sensory Science, and Marketing Research Approaches. 5. Validity and Reliability in Sensory Science. 6. The Interface Between Psychophysics and Sensory Science: Methods vs. Real Knowledge. 7. Descriptive Panel/Experts vs. Consumers. 8. Sample Issues in Consumer Testing. 9. Hedonics, Just–About–Right, Purchase and Other Scales in Consumer Tests. 10. Asking Consumers to Rate Product Attributes. 12. Choice of Population in Consumer Studies. 13. Biases Due to Changing in Market Conditions. 14. Sample Size N or Number of Respondents. 15. The Use and Caveats of Qualitative Research in the Decision Making Process. 16. The Four D′s of Sensory Science: Difference, Discrimination, Dissimilarity, Distance. 17. Replication in Sensory and Consumer testing. 18. Language Development in Descriptive Analysis and the Formation of Sensory Concepts. 19. Use of References in Descriptive Analysis. 20. Training Time in Descriptive Analysis. 21. Consumer–Descriptive Data Relationships in Sensory Science. 22. 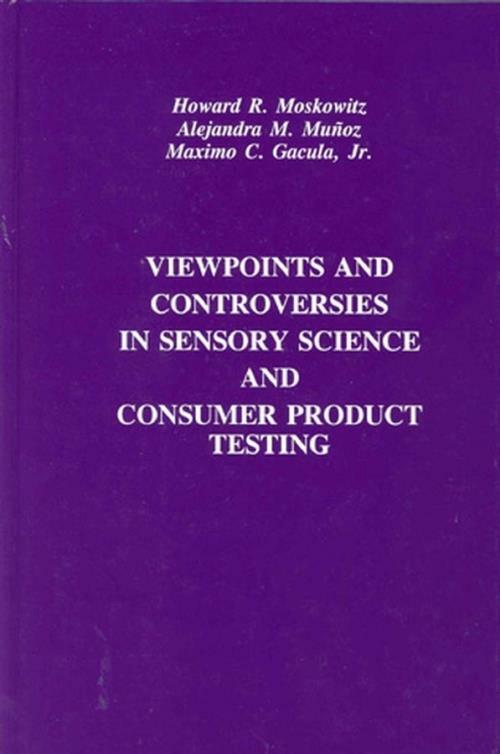 Product and Panelist Variability in Sensory Testing. 23. Foundations of Sensory Science by Daniel Ennis. 24. Applications of SAS Programming Language in Sensory Analysis by Maximo Gacula, Jr.
25. Advances and the Future of Data Collection Systems in Sensory Science by André Arborgast, Chris Findlay and Paul Lichtman.